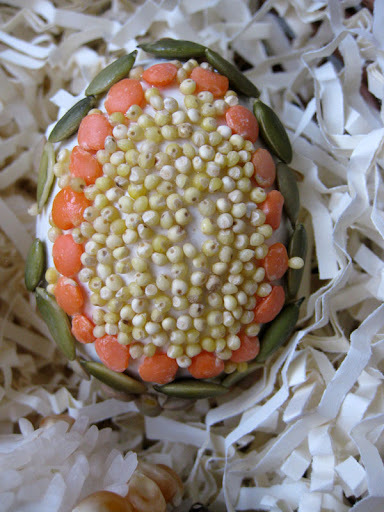 Petite Planet: Beautiful, Unique Easter Eggs Decorated with Seeds, Grains & Beans! 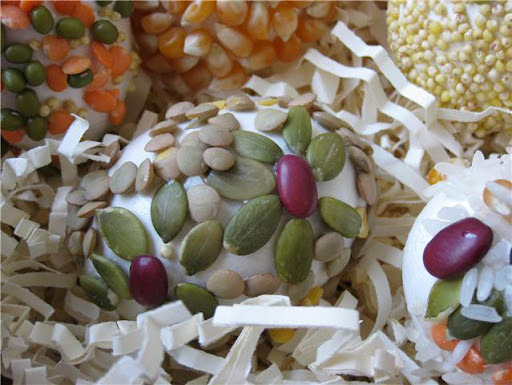 Beautiful, Unique Easter Eggs Decorated with Seeds, Grains & Beans! Oh, the fond memories of coloring eggs the week before Easter! Remember those colored tablets that would fizz in the cup, and the neon colored dye that would remain on your hands for days to come? While packaged egg dyeing kits are still readily available, there are so many greener, craftier ways to decorate your Easter eggs. 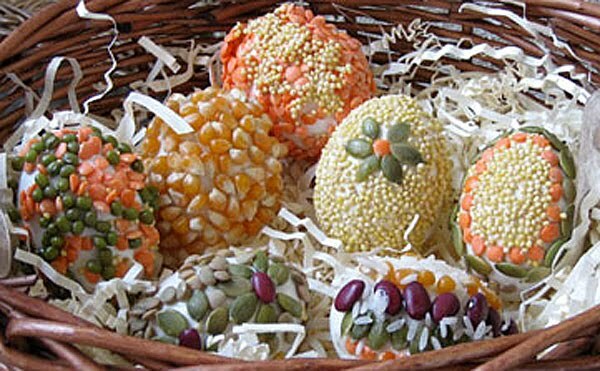 This year, I decided to make unconventional, rustic looking eggs by decorating them with various nuts, grains, seeds and beans: raw pumpkin seeds, uncooked rice, lentils, beans, orzo and popcorn! To do the same, all you need is some creativity and a few things you already have in your pantry! Anything else you can find in this realm! 1) Hard boil your eggs and let them cool and dry completely. 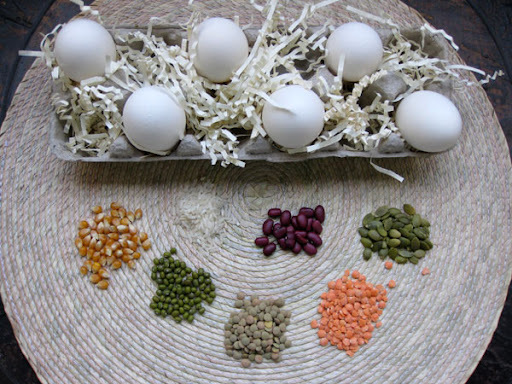 2) Gather the seeds, grains and beans you'd like to decorate with. You will need a food safe glue to use if you plan to eat your eggs once the holiday has passed -- also keep in mind that they will still need to be stored in the refrigerator if you have future plans to eat them. And any type of glue will do if you are going to use them for display purposes only. 3) Next, coat the egg in glue and get in touch with your inner artist! 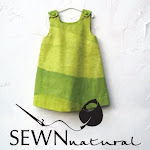 This craft is especially great for older kids -- it's a nice way to slow down, unwind and pass the time bonding together. If you have little ones in your household, make sure to supervise them during the process and display the eggs out of their reach -- since they are covered in small, uncooked items, such as beans and seeds that may look inviting to eat, but will pose a choking hazard. 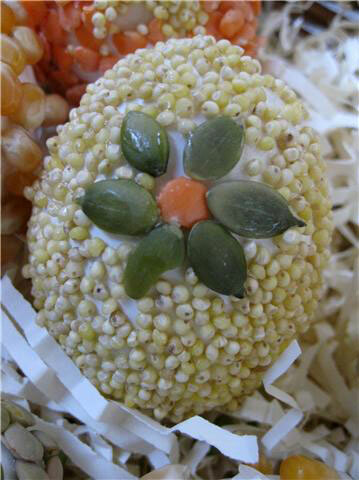 Another idea for eco-friendly egg decorating is to color your eggs naturally. 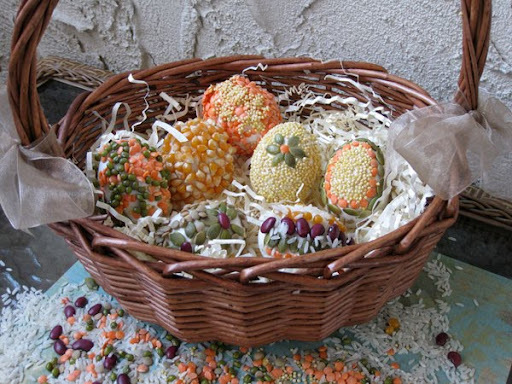 Click here to view a step by step tutorial on how to dye Easter eggs using fruits and vegetables! And don't forget to compost the shells of your Easter eggs once peeled! This is darling and you could use wooden eggs and cover them and you would have them to re-use every Easter.